John Thomas Adamson, 77, a lifelong resident of Carey, Idaho, passed away peacefully Sunday, Dec. 16, 2012, at home surrounded by his family after a courageous battle with cancer. He was born Nov. 25, 1935, in Hailey, Idaho, to Robert Eldon and Vera Adamson. He graduated from Carey High School in 1953, then attended Trade and Industrial School at ISC (later ISU), where he learned the art of body and fender work. He served a two-year mission for the Church of Jesus Christ of Latter-day Saints in the New England states from 1956 to 1958. After his mission, he returned home to work in the family business, Adamson’s Inc.
For approximately 50 years, John served in various positions in the Boy Scouts of America influencing the lives of many young men and helping dozens of them earn their Eagle rank. He received the Silver Beaver Award for his many years of service. 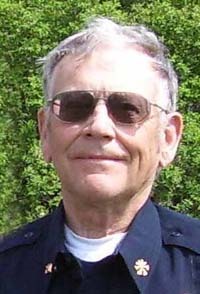 John also served as the Carey fire chief for 46 years, from 1960 to 2006. On Oct. 31, 1975, John married his eternal companion, Twila Rae Mecham Shaffer and her six children, whom he later adopted. The entire family was blessed by this union. He was as an active member of the Church of Jesus Christ of Latter-day Saints, serving as the first bishop of the Carey 2nd Ward and later as a temple worker in both the Boise and Twin Falls temples. In 1987, John and his son Mike established M&J Motor where he worked until his death. He had many hobbies, which included antique gun collecting, restoring old cars, packing into the Head of the River and camping with his family. He was preceded in death by his wife, Twila; his parents; and one grandson. He is survived by his brother Robert (Emma) of Carey; six children, Larry (Karla Kay) Shaffer of Carey, Gary (Sarah) Adamson of Orem, Utah, Rosemary (Rick) Peterson of Carey, Lori (Phillip) Cooper of Valparaiso, Ind., Susan (Timothy) O’Crowley of Diamond, Ore., and Michael (Ranae) Adamson of Carey; and 29 grandchildren and 30 great-grandchildren. Services will be at 11 a.m. Saturday, Dec. 22, at the Carey LDS Church. Friends may call at the church one hour prior to service. Interment will follow in the Carey Cemetery. Arrangements are under the care of Wood River Chapel. Friends are invited to leave a condolence, photos or light a candle at www.woodriverchapel.com.